“Today Elizabeth Warren, sometimes referred to by me as Pocahontas, joined the race for President. Will she run as our first Native American presidential candidate, or has she decided that after 32 years, this is not playing so well anymore? See you on the campaign TRAIL, Liz!” – tweet from our “President” Donald Trump. I don’t want to focus so much on the tweet- long story short- Elizabeth Warren grew up being told she had Native American heritage and believed that. She took a DNA test, realized it wasn’t true and apologized. I’ve never had DNA testing but if I grew up being told I had Native American heritage my entire life- I would probably believe it as well. None of that has anything to do with what I want to write about though…the only thing in that tweet that jumps out at me is exactly what he wanted to jump out- TRAIL. Sadly, this isn’t the first time that our “President” has used the suffering of Native Americans as a jab at a political opponent; he previously invoked the Wounded Knee massacre towards Ms. Warren as well. 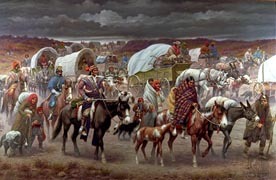 I was listening to some news and they had Betsy Theobald Richards, a citizen of the Cherokee Nation, on there talking about the situation and she was throwing out some facts and history about the Trail of Tears and I found it interesting because I remember it being mentioned in US History class but not in a lot of detail. I mean, it just describes the journey (or trail) that the Native Americans took when they had their land stolen and was given a small area to live, right? A president shouldn’t personally attack anyone but, even more so, make fun or light of a tragedy and genocide of an entire group of people…but maybe he didn’t realize just how big of a deal it was- he seems less educated than I do and just thought it was a route they took. I consider myself highly un-educated on the situation so I’ve spent the last week researching and learning about it. In 1823, the Supreme Court handed down a decision which stated that Native Americans could occupy lands within the United States but could not hold title to those lands. This was because their “right of occupancy” was subordinate to the United States “right of discovery.” They are called “Native Americans” because they were hear first yet Europeans stole the land and then created laws to strip them of their rights to their own land and then the Supreme Court backed those laws. On May 28th, 1830- President Andrew Jackson signed “The Indian Removal Act” which was basically just another way for the United States government to force Native American’s to move west of the Mississippi and allow the government to steal more ancestral homeland. The removals included members from the Cherokee, Muscogee (Creeks), Seminole, Chickasaw, Choctaw and Ponca nations and many of these people died from exposure, disease and starvation while making the long journey to the areas the government had set aside as Indian Territory. Please understand that these relocations were forced by the US government with little to no regard for the Native Americans. These groups of people were forced to march to their destinations by state and local militias. Many places claim that the death toll was only about 4,000 but those numbers are usually only based on the definition of “Trail of Tears”- many claim that it should only cover those that were physically forced to relocate near the end but I believe that it should cover ALL Native Americans- even those that relocated on their own- they were well aware of the outcome if they had stayed so they faced some of the same hardships even though some would say- “by their choice.” None of the relocations were decided by Native Americans (even if they were “negotiated”). While some relocations were “negotiated” by leadership, such as the Treaty of New Echota, many Cherokee felt betrayed and over 16,000 signed a petition to prevent its passage. While many Native Americans left on their own, the May 23rd, 1838 deadline was getting closer, so the remaining Cherokee were rounded into camps and pressed into oversized detachments and forced to complete the “death march”. Due to the size of the groups, communicable diseases spread quickly resulting in the largest death toll. This country was “discovered” and then stolen and as America grew, American settlers started pressuring the federal government to remove more and more Native Americans from the Southeast in order to allow for more land to be available to new European settlers. Native Americans were here long before this country was “discovered” and while they accepted the illegal immigrants into their land- they were only rewarded with slaughter, violence and having their lands ripped away from them. They continued to be relocated with each time resulting in the Europeans wanting more and more of the land. Those Native Americans who had the means complied with the “law” but those that were poor (and weaker) were forced to give up everything and make a journey (through some of the hottest and coldest times of the year) to these new locations. Not only were they forced to make this “death march” but they were forced to take the same route as all of those that came before them…marching through lands that had already been stripped bare of any resources. Today, there are roughly 5,220,579 Native Americans left- only 1.6% of the total US population. Maybe this is why our current “president” is so against illegal immigration- when you see what the illegal European immigrants did to the Native Americans (and continue to do and make fun of) then you realize that maybe he is deathly afraid of history repeating itself. It’s believed that the name for this tragic removal came from a Choctaw leader who stated the removal was “A Trail of Tears and Death,” a devastating even that removed most of the Native population of the southeastern United States from their traditional homelands. This ties into why I no longer celebrate Columbus Day (one of most lied about holidays and person in our history) and instead celebrate Indigenous Peoples’ Day. We need to learn the true, horrific history of our country and not just skim over the “bad” parts. I remember learning so much about Columbus sailing the ocean blue in 1492- as children we were taught to literally sing the praise of a mass murder while almost completely overlooking the unhuman treatment of the Natives who originally inhabited this land. It’s time we all face (Native) American Reality and teach future generations the true story of our country and how it created a Trail of Tears that continues to flow almost 190 years later.